The two sequences below are from the Bromma Air Show in Stockholm in August 1986. It marked the 50th anniversary of the inauguration of Bromma Airport, as well as the 40th anniversary of the foundation of SAS. The weather conditions were not to the liking of the photographer, but I think my wife did as good a job as possible. 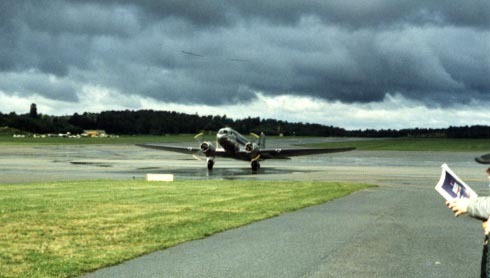 This DC-3 in immaculate condition is called "Daisy" and is owned by the non-profit organization Flygande Veteraner (Air Veterans) based at Bromma. 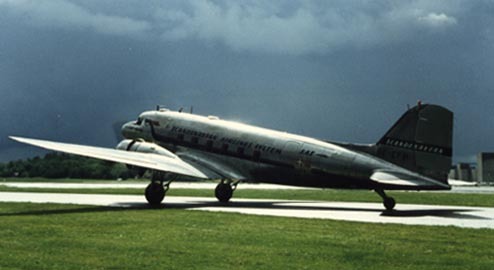 Built in 1943, after seeing war service with the USAAF, the future Daisy went to DNL, the Norwegian parent company of SAS, in 1946, was transferred to SAS itself in 1948 and then to the Swedish domestic airline Linjeflyg in 1957. 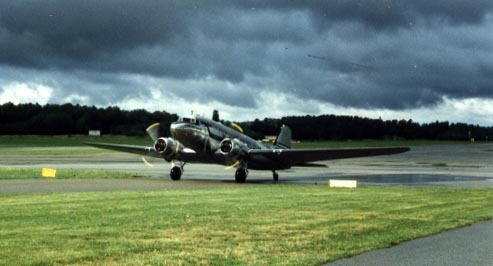 It was sold to the Swedish Air Force in 1960, from which it was purchased by Flygande Veteraner in 1983, and given back its old Swedish civil registration SE-CFP. It was painted in SAS colours of 1948 for the jubilee in 1986 - and is still wearing them to this day. Above is an even older aircraft, in no less immaculate condition. 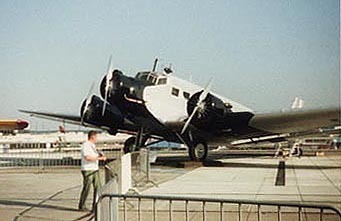 Amazingly, this Junkers-Ju 52/3m is another ex-DNL and SAS aircraft! It was built in 1936 and served with Deutsche Lufthansa for a few months before being sold to DNL in Norway. During the German occupation of Norway it was used by the Luftwaffe, but reverted to its Norwegian owner after the war. 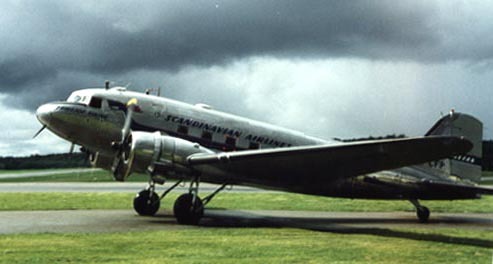 When the European routes of the parent companies were placed under the SAS umbrella in 1948 it was painted in SAS colours until sold to South America in 1956. It eventually turned up in the USA from where it was acquired by Lufthansa in 1985, which set up Lufthansa Traditionsflug to operate it. Its registration is D-CDLH, whereas D-AQUI is a phoney registration. ... when there was such a thing as a viewers' terrace at an airport. 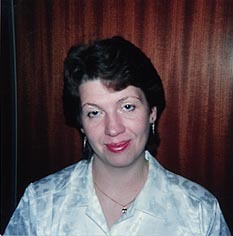 This photo was taken at Frankfurt Airport in July 1987. 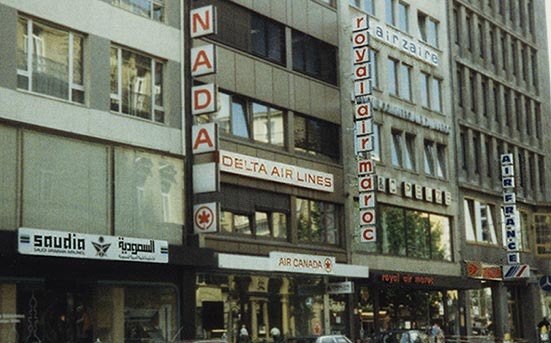 ... when a street in the centre of a big city could look like this: packed with airline offices. How many can you identify? Click here for the answer. The view is from Friedensstrasse in Frankfurt, also July 1987. Believe it or not, but I have other interests but airliners and ocean liners - e.g. art and architecture. I didn't just go collecting timetables during that trip to Germany in 1987. 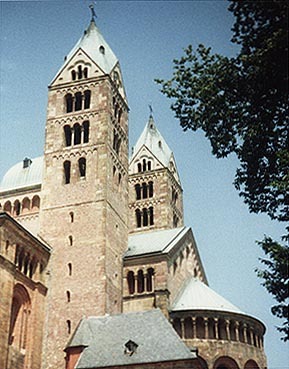 I also visited the great romanesque cathedrals of Speyer (east front above, late 11th century), Mainz and Worms - I love that period. Here is a DC-3 active into the 21st century! C-GPNR is one of several DC-3s operated as freighters by Buffalo Airways of Yellowknife on the shores of the Great Slave Lake in the Northwest Territories of Canada. It was captured on a visit to Edmonton's Municipal Airport in the early 1990s. Finally, a 1990 shot from Flugausstellung Peter Junior, an aviation museum, nicely situated on top of a hill near the small town of Hermeskeil, not far from Trier in Germany. 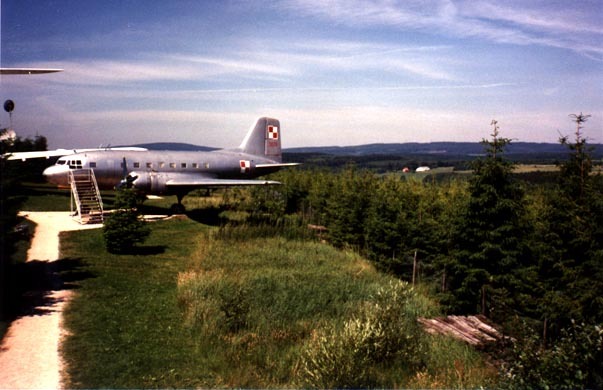 The aircraft is an Ilyushin Il-14 built in 1954 and formerly of the Polish Air Force, but with the museum since 1988. There are several other airliners of interest, like an ex-Lufthansa Super Constellation, an IL-18, a Comet 4C and a VC-10.